Egypt is a model of religious moderation and coexistence, Lebanon’s President Michel Aoun told Egypt's Coptic Pope Tawadros II Monday during a meeting in Cairo. In an official statement, a spokesperson from the Coptic Orthodox Church’s said Aoun gave a short speech during his visit with an official delegation to the papal seat at Cairo’s Saint Mark’s Cathedral, expressing his happiness to visit Egypt. “We live in difficult times, especially with the world around us aggravated by a sectarianism that was able to destroy many areas. Our visit is an emphasis on the spirit of fairness and love,” Aoun said in a speech. “We pray for the stability of Lebanon, the Lebanon that is mentioned in the bible. All the arts, literature, poetry, and beautiful aspects of humanity… we remember in Lebanon,” the Pope said. 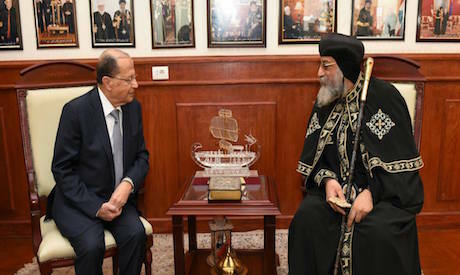 Tawadros added that he hoped Aoun’s visit would strengthen ties between Egypt and Lebanon, saying that cooperation between the two countries enriches diversity, unification, and interdependence. Tawadros said he also enjoys good relations with Egypt’s President Abdel-Fattah El-Sisi, the cabinet and its Prime Minister Sherif Ismail, as well as other Christian sects in Egypt. “We are building a new Egypt; the country is developing right now in terms of stability. You might have noticed mega projects like the new administrative capital, land cultivation, and other projects,” Pope Tawadros II said, speaking about the government’s ongoing efforts on development.